The easiest way to secure the front or rear entry to your home. No cables, no wires, 100% do-it-yourself installation! 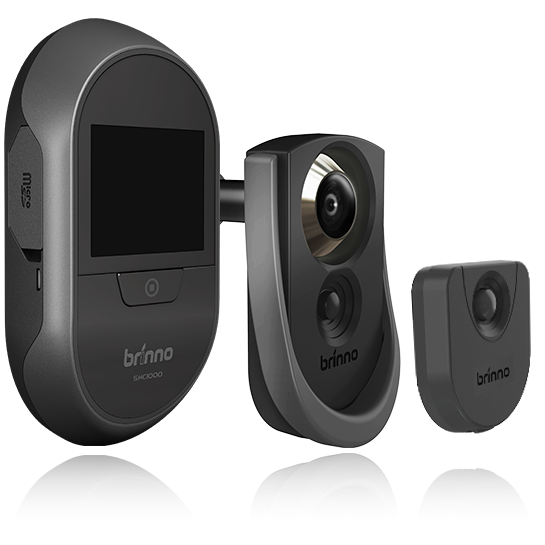 The Brinno smart door camera makes you feel safer at home. Images of every visitor who approaches your front or back door are automatically taken. The images can be viewed without a computer at any time. This gives you a very safe feeling! The SHC1000 is attached to the inner side of the door. The attached camera is not visible from the outside . The SHC1000 is very easy to install, and can be used without cables or wires. The camera is very energy efficient and can be used for months with 4 standard AA batteries. Every movement is detected by the motion detector, which will activate the door camera. anywhere near the front or rear door. With the latest camera technology and a large and clear screen, the SHC1000 makes sharp images of visitors that can be viewed anytime in the digital visitor log, without a computer! The invisible smart door camera with motion detector on the outside makes you feel safer at home. The operation of the SHC1000 is so easy that everyone can use it, young or old. The Brinno SHC1000 increases the feeling of safety for young children who are not allowed to open the door, and for adults and elderly people who do not want to open the door so they can keep unwanted visitors outside. Pictures of visitors's faces are taken are taken from the front, and not from a side view. You can immediately see who is at the door. The separate motion detector can be mounted anywhere near the front or rear door. The smart door camera automatically captures every movement of every visitor. Take pictures of visitors and view them anytime with one press of a button. '- 4 standard AA batteries will last for 1,800 triggers, or at least 6 months. The smart door camera can be easily connected to a new or existing door viewer. Door knocker casing; Motion sensor unit (inside knocker casing); Receiver unit; Magnetic wall mount; Battery lock; Screwdriver; 1 CR2450 battery.